Pine Haven Christian Communities is dedicated to serving residents with dementia with compassion and respect. Every staff member completes dementia care training, and we strive to keep God's covenant with His people by ensuring every resident is cared for the way Christ would care for them. People who have problems with memory, language or thinking, referred to by the medical term, "dementia," have unique needs and require specialized care. Beginning with our Covenant Home, our first memory care home, Pine Haven has designed our memory care households specifically to address these needs. We named it Covenant Home to remember God’s covenant with His people which has been demonstrated through the gift of Jesus and His faithfulness to those who accept and follow Christ. This covenant is at the heart of our mission and vision, which drives us to provide a sense of safety and security – the comfort of home – to all our residents. All staff working in our memory care households have been specially trained in dementia care. All staff throughout all our campuses are required to complete a series of Teepa Snow dementia care programming, as well as to participate in a "dementia virtual tour" which builds empathy for our residents, so they can better understand their perspective, and provide compassionate care. Pine Haven Christian Communities is so dedicated to the care of those with dementia. On our Giddings Avenue campus, our original Covenant Home offers 51 rooms for early stage memory care. On our Haven Drive campus, there are two Covenant Home households with 24 rooms for later stage memory care. Our Haven Drive campus also offers our Faith Home - a memory care household dedicated to residents who also have high physical acuity – something that we have never seen at any other organization. This will help residents manage costs, while providing customized care to meet both the physical and mental needs of residents, who previously may have been moved into skilled nursing care based on their physical needs alone. It is a unique solution that we believe will help provide better, more compassionate care to our residents. Looping hallways and enclosed courtyards, so residents can safely be free to wander. Looping hallways mean that residents never come to the end of a path while wandering, which is important because endings in pathways may stimulate anxiety as the resident then has to determine a solution to the closed off path. Longevity of staff - build familiarity to encourage calm and reduce agitation. While many memory care residents may have difficulty remembering names, regular repeated contact builds a sense of familiarity and belonging, which promotes a feeling of calm and safety. Resident centered care - ensures residents' needs are what decide their schedule. Creating a schedule around the residents needs and desires helps reduce stress to the resident, and minimizes unwanted behaviors. 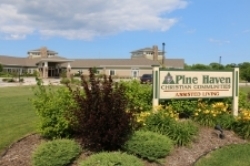 Pine Haven Christian Communities is a certified provider of the Wisconsin Music & Memory program. Many residents in our Covenant Home find these activities soothing and familiar. Dementia care residents who may have difficulty communicating through words can still remember and sing along to their favorite hymns. Pine Haven's Memory Care Life Enrichment programming is designed to keep residents engaged – through mind fitness exercise and cognitive training. Many residents enjoy watching and listening to the songbirds in our aviary. Covenant Home at Giddings Avenue campus: 200 sq. ft.
Covenant Home at Haven Drive campus: 259 sq. ft. Faith Home (Acute/Memory Care) at Haven Drive campus: 277 sq. ft.
A brief, printable brochure about our Memory Care program can be downloaded here.